ANDOVER - Mr. Ronald W. White, 87, died Thursday Feb. 7, 2019, at his residence in East Andover. ANDOVER – Mr. Ronald W. White, 87, died Thursday Feb. 7, 2019, at his residence in East Andover. Born in East Andover, on April 13, 1931, he was a son of Chesley and Edna (Spares) White. He was a graduate of Andover High School. 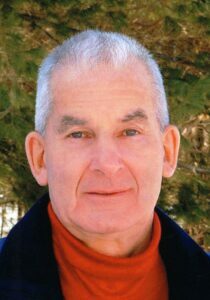 Ronald worked as an Electrical Foreman for Boise Cascade Paper Mill in Rumford until his retirement in 1990. Ronald was well known in the area for his Model-T cars and One Lunger Engines; he also repaired antique clocks. He was a self-taught piano and guitar player. Ronald enjoyed carpentry, machinist work, and windmills. He loved spending time with his family and cat, Tom. Survivors include his former wife, Marilyn Gammon White of Andover; two daughters, Beverly White of Andover and Paula Barber and husband, Ken of Seeley Lake, Mont., three sons, Kenneth of Andover, Larry and his wife, Stephanie of South Paris and Chesley of Rochester, Wash.; a brother, Russell and his wife, Viola of Ashland, Va.; eight grandchildren; and nine great grandchildren. He was predeceased by a son, Matthew; and a sister, Shirley White Parkman. Friends and relatives are invited to sign the online guest book and share memories with the family at www.meaderandson.com. Funeral services will be held 1 p.m., Friday February 15, at the Calvary Bible Church in South Andover. Interment in the spring will be in the Woodlawn Cemetery in Andover. Friends and family are invited to call at the Meader & Son Funeral Home 3 Franklin Street, Rumford, on Thursday from 6-8 p.m.